Members of an indigenous group in Colombia say they have driven about 100 soldiers from the military base they were guarding in southwestern Cauca province. The Nasa tribe had given the security forces an overnight deadline to leave. They say they are tired of being caught in the middle of confrontations between the army and members of Colombia's largest rebel group, the Farc. The army said it had moved its men temporarily to avoid further clashes. Army commander General Alejandro Navas said the soldiers were still on the mountain where they were based, but had moved further down its slope. Local media described how some 1,000 Nasa surrounded the army post, grabbed one of the soldiers and carried him 10m (35 feet) down the mountain. 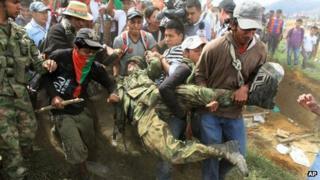 A soldier fired into the air to disperse the Nasa, who in turn threw soil at the armed forces. The Nasa say 250 of them will stay on the top of the mountain to prevent the soldiers from returning. Tension between the security forces and the indigenous groups around Toribio, in Cauca province, have been growing for the past week. After days of attacks by Farc rebels on the police station in Toribio, the Nasa demanded the security forces and the rebels take their fight elsewhere. They dismantled trenches erected by the security forces. They also marched on a rebel camp in the mountains and told the Farc to leave. Defence Minister Juan Carlos Pinzon said the security forces would stay in the area and continue fighting the Farc. Mr Pinzon said the government would continue dealing with the indigenous population through "dialogue and respect", but warned them not to break the law. The steep mountainous area is a Farc stronghold and a key corridor for the trafficking of cocaine. Indigenous groups say they are bearing the brunt of the fighting between the government forces and the rebels. They say the presence of the security forces attracts the rebels, whose mortars often miss their intended targets and kill civilians. They want to assume control of the area and guard it themselves.